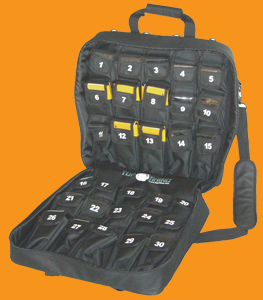 The Top Rhino soft case Graphersack TR-30SC has 30 numbered pockets for graphing calculators like the TI-84 or Nspire CX. Also fits TI-10 and TI-15. Pocket flaps have windows to check inventory at a glance. Zip-up case has carry handles, shoulder strap, and outside pockets. Case can be hung open on a wall by its hooks. Measures 19″ x 19″ x 6.25″ (zipped), and weighs 7 lbs empty.